This acclaimed ebook offers a fun, comprehensive and conversational guide to interviewing people as a journalist, covering all the detail you need, from planning the interview to writing it all up. Want to learn how to interview people as a journalist? Or maybe you're a pro in need of a refresher course, with some fresh ideas thrown in. 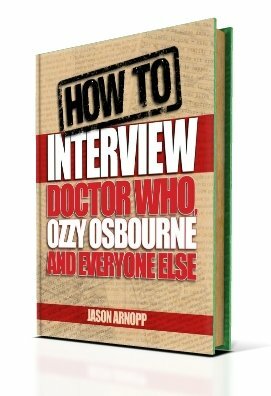 Let HOW TO INTERVIEW DOCTOR WHO, OZZY OSBOURNE AND EVERYONE ELSE be your guide! Drawing on well over 25 years of experience and with over 1000 interviews behind him, British writer JASON ARNOPP aims to tell you everything he knows about interrogating the great and good. He has spent these decades interviewing celebrities and rock stars for the likes of Heat, Doctor Who Magazine, Q, SFX and Kerrang!, but the vast majority of the principles described here will apply to ANY journalistic interviewing task. You need this book in your toolbox! Written in an engaging, conversational style, HOW TO INTERVIEW... packs in over 28,000 words of practical wisdom. You’ll learn about the craft of interviewing, all the way from deciding how you’ll record your interviews, to devising questions, to dealing with various types of interviewee, to writing and editing your article. Beyond that, however, you’ll get a real feel for what it’s like out there on the front-line. The surprises which PR folk may spring on you when you arrive to conduct your interview. The challenge of getting a reluctant, or even downright angry, interviewee to warm to you and open up. Even what to do when you realise that your recording device has failed to record the interview! Author Arnopp even offers a 100% money back guarantee: if you're not satisfied with his book, you can contact him via JasonArnopp.com and receive a full refund. Learn the JOURNALISTIC SECRETS of interviewing, with this incredible, indispensable volume! If you sat the author down in a bar, bought him drinks and picked his brains, leading scientists estimate you'd pay ten times as much as the price of this book! SUPER EASY PURCHASE! Once you have completed Payhip's simple checkout process, the book will be automatically sent to your email address in three different file types, to suit any given platform.